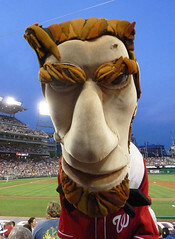 Racing Presidents get Botox treatment over All Star break | Let Teddy Win! I like old Abe, Tom, and George. Teddy looks fine in his new incarnation. Are the actual mascots looking different? I didn’t notice anything on Tuesday, but I was pretty far away. I’m okay with Teddy, and I might get used to Tom and Abe. George looks awful though. The costumes we pretty beat up, so I can see why they wanted to make new ones. Agreed re George. Did you see him at the Park? Those new lips look 10 times worse in profile. The new Teddy doesn’t look too much different, but the others are not good at all–Abe actually looks more menacing to me and I agree w/Presidents Race Fan about George’s lips–weird! OMG, in person, George’s lips look like Meg Ryan’s. FAB-ULOUS! Two snaps up! They should have a contemporary Presidents race with Obama, W., Clinton, and Bush Sr.